In a major success, the police has arrested 10 notorious criminals on charges of murder, extortion and attempted murder. However, what sets these men apart is the fact that each member has an estimated earning of over Rs 2 lakh per month and can easily put any top B-School graduate to shame. They have been in and out of jail for an array of criminal activities, including murder, extortion and attempted murder. According to the police, they were the face behind the “peti” mafia, illicit liquor trade and drug peddling in the city. These brand-conscious youths are the new generation of criminals that the city police is currently dealing with. Sachin, Ajaypal, Kakkri, Palla, Johnny and Kali, all members of the Mohani gang and residents of Daresi and surrounding areas, were arrested from the railway station area. However, the kingpin of the gang, Mohani, managed to escape the scene. Similarly, Honey Sidhu, Jagroop Rupa and Butta Nonna of the Ghuggi gang were arrested from the Guru Nanakpura area. The gang leader, Ghuggi, is also at large. The arrest of Gugga, kingpin of the third gang, a fortnight ago led to the busting and arrest of the other two gangs. “Each member of the gang has a daily income of around Rs 30,000 to Rs 40,000 from anti-social activities. Palla and Johnny were operating as their conduits and used to arrange money for them. The arrests will come as a huge relief for the residents of the old city area, as they had been living under constant fear of these criminals,” said ACP Swapan Sharma. Police sources said the three gangs had been operating at will. “Gang war was turning ugly with each passing day. The members of the Mohani gang were behind the shootout that took place in the Haibowal area last month, which left a youth injured. Fortunately, they are not organised. Had they been organised, it would have been quite difficult to arrest them,” he said. The sources said the arrests were made following election commission’s guidelines to crack down on anti-social elements. The city police had received a rap during a recent meeting of the Chief Electoral Officer for going soft on criminals. These hi-tech gang members made optimum use of video-sharing website YouTube and multi-media messaging service (MMS) to terrorise their rivals. Mohani and his aide Sachin had recently abducted their rival gang leader, Pawan Kumar Talli, and created an MMS in which Talli was stripped naked and shown begging for mercy from Mohni. The MMS was circulated to terrorise their rival gangs. These gangsters enjoyed the backing of political bigwigs. The arrest of these youths has come as a major setback for politicians, who were looking to make optimum use of these habitual offenders during elections, say sources. The three gangs had recruited a large number of people to run the “peti” mafia. The groups used to mint money by ferrying hosiery goods without bills to the local railway station on auto-rickshaws. The gangs were also involved in snatching and illegal possession of disputed properties. Besides, they had hired a battery of conduits, including a high-profile middleman, Sarjeevan, who ran the illicit liquor trade for the gang members. They were also amongst the biggest peddlers of smack in the industrial town. Cold wave has gripped the region with the minimum temperature plummeting to 2.2 °C in the past 24 hours. This is the lowest temperature recorded in the city in December this year. Last year, mercury had touched 2.6 °C. The temperature is four degrees below normal. However, there hasn’t been much change in the day temperature, which is hovering around 20 °C. Dr KK Gill, assistant agro-meteorologist, Punjab Agriculture University (PAU), says the night temperature has fallen drastically in the past 24 hours. The reason for the fall is the sudden blowing of northerly winds. “Snowfall has been witnessed in the higher reaches due to which chilly winds have started blowing. The minimum temperature has come down further. As such, the temperature has fallen all over Punjab. Similar weather conditions will prevail in the next 24 hours,” adds Dr Gill. While the director, weather department, Chandigarh, Surinder Paul, says both minimum and maximum temperatures will fall further after two days. “We can expect more fog in the region,” he adds. Those worst affected by the sudden cold wave have been schoolchildren and the downtrodden. Many schools have not yet changed their winter timing and plan to reschedule it after the winter break. Monika Jain, a homemaker, said till recently, the temperature was normal but in the past 24 hours, chilly winds had started blowing and it was becoming difficult to send small children out in such severe weather. Prem Narayan, a rickshaw-puller, said December and January were the worst months for the poor, as they had to bear the chilly weather out in the open in the absence of any shelter. “To keep ourselves warm, we sip tea. In the evening, we make a small fire to keep the chill at bay,” he said. If you want to get a refilled domestic LPG cylinder, you will have to wait for 21 days to get it booked. And even after the booking, it will take between nine and 12 days to get a cylinder. But if you are ready to shell out a few more bucks, you may get a cylinder at that very moment or within five to six hours. All this, thanks to callousness on part of authorities concerned, which have failed to ensure regular supply of domestic gas cylinders to the consumers in the city. A survey by The Tribune revealed that certain dhaba owners and supply trolleys were openly selling the cylinders on the black market, while the agencies are running short of refilled cylinders for regular customers. Inder Singh, a resident of Punjab Mata Nagar, said he had got a refill for Rs 700 from a dhaba in Dugri. “My friend told me that a particular person could help me get a cylinder immediately. Since we were expecting a few guests at home, I went to the dhaba owner and gave him my friend’s reference. He demanded Rs 700 and asked me to come after two hours. When I went there again, a sealed cylinder was available for me,” he said. There is a shortage of domestic gas cylinders in the city due to the winter season. To keep a check on the agencies, we have constituted a team with inspectors, who will conduct a random survey of the agencies to make sure that the consumers get regular gas supply. With poor visibility and thick cover of fog engulfing the northern region, the rail traffic has gone completely off the track and most of the trains passing through the city are running behind schedule by two to seven hours. To add to the misery of the travelling public, the railway authorities have cancelled a few more trains till January 31. Railway officials said due to operational problems created by foggy weather and poor visibility, 12413/12414 Puja Express running between Amritsar and Jaipur, 12460 Amritsar-New Delhi Express and 14681 New Delhi-Jalandhar Express trains will remain cancelled till January 31. Among the trains running behind schedule were 18101 Mury Express (12 hours), 12919 Indore-Jammu Tawi Malwa Express (4 hours), 12029 New Delhi-Amritsar Shatabdi Express (3.30 hours), 15707 Amrapali Express (7 hours), 12054 Jan Shatabdi Express (7 hours) and 15210 Jansewa Express (7 hours). The railway authorities did not rule out the cancellation, suspension, short termination or late running of more trains if the prevailing weather conditions continued without any improvement in the days to come. Panic gripped Pink City in the Kakowal area after the body of a middle-aged man, done to death with bricks, was found lying on the roadside here this morning. The victim could not be identified, as he his face had been disfigured. According to the investigating officer (IO), the victim was assaulted with bricks. After killing the victim, the perpetrator disfigured the face using bricks. The incident came to light this morning when some residents saw the body lying in a pool of blood. Vijay Kumar, a resident, said stray dogs were spotted wandering around the body. “We raised the alarm and informed the police about the matter. The victim’s face had been disfigured so that he could not be identified,” said Vijay Kumar. 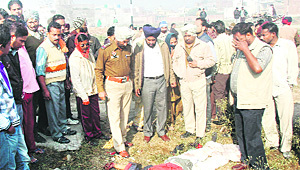 The IO said the victim was killed elsewhere and his body was dumped in the Pink City area. The police has registered a case of murder against unidentified persons and initiated process to identify the victim. The discovery of a body in the area left women and children shocked. Students going to school were taken aback seeing the disfigured body. To top it all, the police called the area residents to identify the victim. When that did not work, the police took the body around for identification. According to the investigating officer, no purse, mobile phone or other valuables, which could help establish the victim’s identity, were found on the body. Campuses are reverberating with the noise and chirps of young boys and girls these days. Listen closely, and you’ll be amused to hear the new language that is emerging out of city colleges. Ask Harpreet about his friends and he introduces them as his “yaar anmulle”. Jasmeet Kaur, pursuing MA (English), says speaking in English is cool but Punjabi is our “maa boli” and comes directly from my “dil”. Some students feel conversations in chaste Punjabi are no longer in. “It is all because of the Western influence. Although I don’t think it is very nice but we have use a few English words while conversing in Punjabi, as I don’t want to sound out of place,” says Charanjit Singh. For Aman Sharma, a BBA student, it is all about the influence of Punjabi pop. “Most new Punjabi tracks are a mix of reggae and English. So the trend just rubs on everyone,” he says. Harvinder Singh says “Baiji” is now part of the youngsters’ lingo in the city. Even if they speak in English, they’ll address other guys on the campus as “Baiji”. For Harsimrat, her friend is not the most beautiful girl. Rather, she is is the most “sohni gal”. “Sohni gal” has that zing that is missing in “beautiful girl” or “sohni kudi”. So, “our boli becomes badi wadiya”, she laughs. “OK, take care, ‘changa’,” she signs off. The court of Additional Sessions Judge Karamjit Singh Kang has convicted Navdeep Singh of Mansura village in a dowry death case. His wife Neelam died due to burn injuries just five months after the marriage. He was ordered to undergo rigorous imprisonment (RI) for eight years. A fine of Rs 8,000 was also imposed upon the accused. Pronouncing the verdict, the court held that the prosecution had proved the guilt of the accused beyond any doubt. Initially, a case under Sections 307 and 498-A of the IPC was registered against the accused at Sudhar police station on April 21, 2004, following the statement of badly burnt wife of the accused at the DMCH. After her death, the police booked the accused under Section 304-B of the IPC (dowry death). The complainant had stated to the police that she was a resident of Jassowal village. She got married to Navdeep Singh on November 17, 2003. She told the police that her husband used to maltreat her and subjected her to cruelty. She was being pressurised for bringing a scooter from her parents. She had alleged that her husband set her ablaze, as she could not fulfill his demands. However, the accused pleaded innocence. Even the prosecution witnesses had turned hostile, following a compromise between the parties. But the dying declaration of the victim, recorded by Judicial Magistrate Anshul Berry, put the husband behind bars. A team of the building branch of the Ludhiana Municipal Corporation (MC) today sealed four commercial premises, including a bank in a posh residential locality of Model Town Extension, for violation of land use. SS Bindra, assistant town planner (ATP) of zone D, who led the operations told a branch of Andhra Bank had been set up in a piece of land, which was located in a residential area. When a notice was issued to the bank, along with some other commercial units charged with the violation of land use, the bank management had obtained a stay order from the Punjab and Haryana High Court. Since the HC stay order has now been vacated, the branch of the bank was sealed. Similar action (sealing commercial premises) has also been taken against a Nokia showroom and two shops of property dealers located in the same area, he added. Ludhiana: Chief general manager of State Bank of India, NK Chari, Chandigarh circle, visited the Vocational Rehabilitation Training Centre for the blind and disabled on the Haibowal road, here. He met all the staff and students of the institute and also donated braille stationery and books to the students through the community service banking. The visually and physically handicapped students presented a cultural programme at the occasion. A team of doctors led by Dr Surinder Gupta, managing director of "diabetes free world (DFW)" and the secretary of Ludhiana branch of the National Integrated Medical Association (NIMA), organised a free diabetes camp at Sidh Peeth Dandi Swami temple, here today. As many as 280 patients were examined by the DFW volunteers and NIMA doctors. Along with Dr Gupta, Dr Rajesh Thapar, Dr Inder Sharma, Dr KK Kharbanda, Dr Sarjivan Sharma, Dr Rahul Jain, Dr Ramandeep and Dr Ish Handa lent their services at the camp. Jorawar Singh, a man who crushed his leg, was admitted to a hospital here. He fractured both the bones of the leg along with injury to the artery. The skin had been damaged and the bones of the patient were exposed in open. In a major surgery carried out by a micro vascular and plastic surgeon, the bones were covered by using muscle of the back by microsurgical technique. The surgery lasted for 6 hours; the patient was stable after surgery. Jorawar was discharged in healthy condition. Dr Jindal said, there was total transaction of posterior tibia vessels along with fracture of bones of the left leg. The limb was salvaged using free lentissimo dorsa muscle flap and vascular anastamosis was done. More than 630 patients were examined at a free eye and medical check-up camp. The camp was organised by the Sri Dandi Swami Mandir Trust in association with Punarjot Eye Bank Society. The patients were given with free medicines. A team of doctors conducted the eye check up of the patients along with a supporting staff. While the patients suffering from various eye ailments were rendered follow up advice. Over 102 patients were identified with corrective surgical procedures that would also be carried out free. 21 months after formal implementation of the Right to Education Act 2009 in all schools of the state, the state government is yet to take organised steps to aware masses about the privileges for children hailing from the downtrodden families. Though the education department has announced to publicise the provision of the Act through painting off boundary walls of all the government schools, the information will be dispersed among those who visit schools and can read themselves. Many social activists and organisers of private schools have once again urged the government to review policies concerned with running of their organisations so that concessions are provided to the students of weaker section without affecting economic viability of their organisations. Investigations revealed that majority of the beneficiaries of the Right to Education 2009 were still unaware about the provisions of the act even after 21 months of the implementation of the act. Leaving apart providing free education to children of weaker section, the authorities at majority of schools insisted on production of certain documents including birth certificate and school leaving certificate at the time of admitting new children. “What to talk of illiterate and poor parents, even members of the elite class are not aware of provisions of the said Act. We have been helping those students financially whose names were struck for non-payment of fee,” said Vikas Tondon, a social activist, regretting that the authorities had failed to spread awareness about the provisions of the act. “Had we known the provisions of the Act we could have impressed upon the schools authorities to provide free educations to children from weaker sections of the society and could help the students in purchasing uniform and books,” Tondon said. Investigations further revealed that authorities at all the government schools of the region had been directed to spread awareness about the act through wall paintings. Perusal of records revealed that deputy state project director, Sarav Sikhiya Abhyian, had directed all the district education officers of the state to ensure that the prescribed matter regarding the Act was scribed on the boundary walls of all the government schools falling under their jurisdiction within fifteen days. The state education department had earmarked an amount of Rs 1,37,42,400 the paintings of 19,632 schools. A 41-year-old woman of Madnipur village has accused the authorities of a private school at Sehora village of violating the norms of the education department. The woman Navkiran Kaur, whose husband died three years ago, lives with her parents along with her two children. Navkiran has alleged that the school paid her lower than she was entitled to. Terming the complaint a concocted story, Inderjit Kaur principal of the school, maintained that the complainant was never employed as a teacher in the institute. “Genuineness of the complaint can be gauged from the fact that she is quoting January 2009 as month of joining service in one complaint and March 2009 in another,” said Inderjit. She added that the school had already established before the authorities that she was never employed in the school. In her complaints addressed to higher authorities including the secretary Punjab School Education Board and the senior superintendent of police at Khanna, Navkiran of Madnipur village has accused the authorities at the Mata Harnam Kaur Memorial School Sehora of allegedly exploiting her helplessness by paying salary much lower that the settled amount. Though she was paid only a meagre amount of Rs 3000 per month, she was made to sign receipt Rs 5500 every month. “And when I refused to accept salary below the settled amount and they terminated me from my services a few months ago,” alleged Navkiran Kaur regretting that even the authorities in the education department had failed to bring her justice. Investigations further revealed that the authorities at the Punjab School Education Board had conducted an inquiry into allegations leveled against the school authorities after which it was construed that the complainant was never posted at the said school. The school authorities had produced copies of records including attendance registers of staff and the salary payment register to substantiate their claim that the complainant was never employed as a teacher in the school. Inderjit denied of having issued the identity card to the complaint, copy of which was annexed with the compliant. Though the complainant had claimed that she had been traveling in the school bus while commuting between her village and the school, driver of the said bus, Charan Singh, deposed before authorities that he never saw her travelling in the bus. The complainant has now urged the higher authorities, including the chief minister and the education minister to impress upon the concerned authorities to get the allegations probed and get her justice. Dozens of patients thronged Phagwara Civil Hospital after the work resumed at the laboratory in all the government hospitals of the state today. The Tribune correspondent visited the local civil hospital on Monday morning and talked with a few patients. Sheela Rani, working as domestic help, told The Tribune that she was pregnant and the doctors treating asked her to undergo for a few lab tests, but she could not afford to spend a huge amount of money at private labs, so she went to the local civil hospital on hearing news of resumption of works by lab technicians. Almost similar stories were narrated by a migratory labourer Anil Kumar, Shanti and Sanjna. It may be mentioned here that, all 1,250 lab technicians working in 400 government hospitals and dispensaries of the state belonging to Punjab State Medical Laboratory Technician Association had been on strike since December 12 in support of their demands. Meanwhile, the ongoing agitation of Sangharsh Committee Punjab State Pharmacist’s Association entered in eighth day today extending their stir for one more week. Association district convenor, Harbhajan Lal, while talking to newsmen, here today, said that the agitation could be intensified,if their demands could not be accepted soon. Recognising concern of the State Bank of India (SBI) towards conservation of environment through eliminating use of paper in financial transactions, a large number of educational institutes have shown a warm response to the bank’s e-banking scheme launched recently. Besides saving parents from wasting time and energy on visiting educational institutes to deposit fee and dues of their wards, the scheme will also help managements of these institutes in fighting the problem of staff shortage. Investigations revealed that the authorities at various colleges and schools of the region falling under Ludhiana and Sangrur had shown keen interest in adopting the e-banking scheme. A team of officials of the bank, supervised by assistant general manager Anuradha Narayanan, illustrated various aspects of the scheme to accounts and cash handling staff of various organisations and highlighted salient features, including elimination of stationery, handling of cash and round the clock availability of payment of fee through accounts opened with the Internet banking. Appreciating the movement of the bank launched to preserve environment, Amjad Ali, chairman Sohrab Group of Enterprises, and Amarjit Singh Sidhu, director Shanti Tara Group of Educational Institutes, said they had advised their staff to initiate the process for availing the facility, which besides facilitating the parents to pay fee of their wards while sitting at their homes, will also help decrease workload of the officials. “When explained that the scheme will indirectly help preserve the environment by eliminating use of stationery, we immediately agreed to implement the scheme for students of senior classes,” said Amjad and Sidhu. Students were also enthusiastic about the scheme. “As we already have the Internet connection, there will be no difficulty in adopting the scheme. We are glad that we will not be required to wait for hours for depositing fee during our study hours,” said students of a local senior secondary school. A delegation of the Punjab Roadways Retired Employees Association held a meeting with Jagraon SDM Isha Kalia in her office on Sunday and submitted a demand letter containing various demands of the retired employees to her. The employees demanded that the difference in pension improving formula among various categories of the employees should be eliminated, 5 per cent interim assistance should be included while improving pensions, medical allowance should be increased from Rs 150 per month to Rs 1,500 per month. They also demanded that LTC dues of beneficiaries should also be released. Earlier, the employees also staged a dharna near Jagraon bus stand and raised slogans against the state government for continually ignoring various pending demands of the retired employees of the Punjab Roadways. Gurdeep Singh Moti said the state government had failed to implement various recommendations made by the Fifth Pay Commission regarding the improvement in the pension. “On the one hand, the state government has been recruiting a large number of employees in different government departments, regularising contractual employees and releasing massive development funds keeping in view the coming Assembly elections, while on the other, the government has been stating that it has no funds for increasing the pensions and allowances of the retired government employees,” he added. Urging the state government to fulfil various just demands of the retired employees at the earliest, the association leader said if the government failed to meet their demands, it would have to pay a heavy price during the forthcoming Assembly elections in the state. When Amrik Ali, a resident of Doburji village took his six-month-old baby Rukhsana for treatment of a chest congestion to a private hospital at Dehlon on December 17, he had no idea that the turn of events would come as a nightmare for him and a traumatic journey for the infant girl. In the course of the treatment at the Dehlon hospital, the infant suffered burn injuries on the face, allegedly due to steam therapy administered by the hospital staff to clear the congestion. When Amrik Ali raised hue and cry over the negligence of the staff, the doctors on duty abused and threatened him. The infant’s father, who brought his badly scalded daughter to a city hospital later that evening, told The Tribune that Dr Balwinder Dhawan, a senior doctor at the hospital at Dehlon virtually threw him out when he charged the paramedical and nursing staff of the hospital with negligence and carelessness. Amrik Ali, a caretaker of buffaloes in the village, said the staff at the Dehlon hospital had not only shown affront to him, but he was made to shell out nearly Rs 10,000 for the “callous and inhuman” treatment of his child. Dr Dhawan first refused to talk saying he would not discuss the matter on the telephone but later said he had no comments to offer on the case. Dr Sanjeev Gupta at a local hospital, who is treating the child now, said there were minor burn marks on the face of the child when she was brought to him. Dr Gupta, however, added that the child was responding to the treatment for burns as well as the chest congestion. Amrik Ali said he would take his complaint of medical negligence to its logical conclusion. “Once my daughter is stable, I will report the matter to the police and the health authorities to seek strict action under the law against the erring staff and doctors at the hospital at Dehlon,” he said. A seven-day research workshop began at BCM College of Education, Sector 32-A, Chandigarh Road, on Sunday. Prof DN Sansanwal, chairman, northern regional committee NCTE, Jaipur, is the resource person. The title of the workshop is “Research methodology, applied statistics and use of SPSS”. Dr SS Sangha (dean faculty of education, PU) was the chief guest. All technicalities and peculiarities related to the field of research will be discussed in detail at the workshop. “Post-harvest losses are estimated to be around 30 per cent in India. If we reduce even one per cent loss that would save Rs 900 crore,” the statement was made by Dr VK Sehgal, head department of mechanical engineering at Punjab Agricultural University (PAU), who was the chief guest at the inaugural function of the two-day NHB and NABARD sponsored national seminar on “Post harvest packaging, cold-chain logistics and instrumentation techniques.” More than 30 scientists and researchers from across the country are taking part in the seminar. Dr Sehgal said desired progress could not be made in reduction of post harvest losses in fruits and vegetables. “Every year we face losses of around Rs 90,000 crore in post harvest due to poor handling, processing, packaging and storage, etc,” he said, adding that technology has moved fast in others sectors, including telecommunication. He told need of the hour is to invest in better transportation and processing to reduce the post harvest losses. Saying that network of facilities are required to be created to address this problem, director CIPHET, Dr RK Gupta said spoilage of food need to be checked at various stages in the food chain. He also informed that CIPHET would be taking over mega project on health foods and soon a state-of-the-art food-testing laboratory would be established in the institute. Manager NABARD, CR Abhavarjan elaborated on funding schemes, including national project on organic farming and rural innovation fund under NABARD schemes. The institute for IT and management degree programmes situated at the Bhai Bala Chowk, I-TECC Academy has celebrated “ITECC Fiesta-2011”, its annual day, on Sunday. Chief guest, Deputy Mayor Praveen Bansal, founder-director Manohar Pal Singh, director Surendra Singh Dhall and centre head Leena Puri lightened the lamp to initiate the celebrations. A fashion show by freshers was highlight of the event and Manik Agarwal and Upasna Garg were selected as Mr and Miss I-TECC. Prizes were also given to winners of performances and academic achievers. Sports meet concluded at MGM Public School here on Sunday. Students from classes IV to XII participated in the sports events such as sack race, spoon race, shoe race, 100 metre, 200 metre, 400 metre and 800 metre races. Director academics, Ashok Kumar Setia and school principal Poonam Sharma gave away prizes to the winners and appreciated their spirit. Gurjot Singh won 800m race. Satnam Kaur bagged the title in 400m, while Riya in three-legged race. The parents’ thanksgiving day was organised at Sat Paul Mittal School on Saturday. Parents participated in the cultural show. The event was organised to acknowledge and recognise the efforts and dedication of management, teachers and support staff of the school. “The day was organised to promote a strong and amiable bond between the teachers and parents, the key societal members that make a difference in a child’s life,” said one of the teachers of the school. 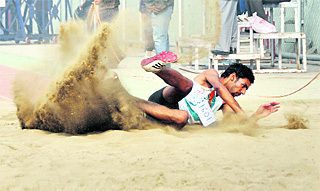 A three-day annual athletics meet concluded at Kundan Vidya Mandir here on Sunday. The students of middle section participated in lazium display, butterfly and flower race. The other events were 800m, 600m races, triple jump, high jump and long jump. Events for the guests were also conducted, including slow cycling race for men and chati race for women. Tug of war between students and staff was also organised. Prizes were given to the winners. A grand baby show was organised at Mothers Pride Pre-School for children. The winners were given prizes and titles of most healthy baby, most attractive baby, most sparkling eyes, most active baby, sunniest smile and friendliest baby. There were also prizes for the most aware parents. An inter-house Punjabi declamation competition was held at Green Grove Public School. A choir of students presented a welcome song. The students were given various topics for the declamation contest including Parikhavan vich nakal di smasayan, Bazurgan da ghar vich sthan, Guruan di ghati da aj de jiwan vich mahatav, Hassee da akal and Reality show kina juth kina sach. DRV DAV Centenary Public School, Phillaur, organised an international exhibition depicting art, culture and traditions of 11 countries of the world. Famous buildings, special festivals and parliaments of 11 countries were exhibited in the exhibition. Ujala 2001, annual function was organised at New GMT Public School. The show also had a wide variety of sequences including daddy cool, it is a holiday, kanak di rakhi, haryanvi dance, christmas carols etc. The play Mitti Rudan Kare with a theme of saying no to drugs was also presented. Teachers of government schools are in a fix over receiving contradictory notifications from the Punjab education department and the Punjab School Education Board (PSEB). The authorities of the departments concerned have issued separate instructions to follow different criteria to evaluate students. The teachers are confused as to who they should obey - the PSEB or the education department? The Continuous Comprehensive Evaluation (CCE) scheme had been introduced in schools under the Right to Education (RTE) Act to evaluate students on the basis of overall personality of students. The PSEB had sent a notification in the beginning of the session in which they adopted the model of evaluation on the basis of monthly test report, pre-board exam results, attendance chart, discipline and home work and co-curriculum activities. On the other hand, the pedagogy wing of the Director General School Education (DGSE) office adopted a different model to evaluate the students. They advised the schools to evaluate students on the basis of amount of effort put in, sincerity and expression. According to the DGSE office notification, the students should be evaluated on a weekly basis. The Chamber of Industrial and Commercial Undertaking (CICU) has asked the Ministry of Finance, Government of India, to include certain pre-union budget proposals for the Union Budget 2012-2013 for the benefit of industry. Ashok Kumar Juneja, chairman CICU Taxes’ Committee and Punjab Tax Bar Association, said in a letter written to the Finance Minister, Government of India, CICU has demanded that tax rates be reduced. The tax rates for small-scale industry and tax practitioners should be 10 per cent and 15-20 per cent for all other industry. The number of assesses be increased since at present only 3 per cent of Indian population was assesses. It will increase the revenue as well. The rates of penalties were too high and require elimination of discretionary powers. Prosecution provisions should be eliminated from the act, said Juneja. Further, CICU said the basic exemption on excise duty be increased from Rs 1.5 crore to minimum Rs 3 crore for the smooth operation of industries. All agro-based units should be exempted from the excise duty since it will provide great relief to farmers and industries. Duty was not payable on yarn/ cotton/thread/cloth etc, all such type of units be exempted from the preview of excise duty. Besides, the ban or effective steps should be taken for discouraging imports of goods, which disturbs the existing trade and industry of India. Juneja also said before finalising the budget, consultation with the chambers, CICU and other trade and industrial organisations was essential and will bring fruitful results. With the onset of winter, some city residents have started working out to beat the chill rather than snuggle beneath quilts and multi-layered winter clothes. Some of them have stated going to gyms to sweat it out rather than shiver at home. Owner of a gym on the Ferozepur Road says the number of people joining their gym has gone up with the onset of winter. “I always hit the gym in the winter. Working out in the heat and humidity of summer is taxing and quite cumbersome,” says Sunita Nagpal, a resident of Basant Enclave. Some residents have taken to jogging to avoid the chill. “I have put on the training shoes. This weather is best suited for jumping, skipping and jogging. Jogging for half an hour keeps me going all the day. Body warmers and heavy woollens are not for me,” says 34-year-old Neeraj Kapoor. For SS Chawla, an Urban Estate resident, winter is the time for more workout, as the season entails intake of more food. “In summer, high water intake leaves little scope for a fulfilling meal. Winter is all about ‘desi ghee’, ‘saag’ and ‘makki di roti’ as also dry fruits and nuts,” he says. “So you have to burn some calories to keep yourself fit,” he says. Jumping into the exercise regimen during winter keeps some active. “Working in the office for 10 hours every day tends to make you drowsy, particularly when you are also cold. Letting the sweat out through aerobic exercises keeps me active all day,” says Sunidhi Arora, who lets her treadmill “out of the summer hibernation” at this time of the year. Malwinder Singh Jaggi, a 1992-batch PCS officer, today took over as the new Commissioner of the municipal corporation (MC) here after AK Sinha was promoted and posted as director, local government, Punjab. Jaggi, who has had an earlier stint as acting commissioner of the MC for a little more than two months early this year (from August 8 to October 16) when the then Commissioner AK Sinha had gone for an in-service training, has made a mark during the Additional Commissioner of the civic body, the post that he has been holding for nearly two years now. Talking to The Tribune after formally assuming office at the zone D of the MC here, Jaggi said development and recovery of arrears to generate more revenue would be among his top priorities. During his stay at the post of Additional Commissioner when he was looking after the building and roads (B&R) branch, Jaggi handled several important projects deftly, which included Partap Chowk flyover, up ramp of Jagraon Bridge, Gill Chowk flyover, pedestrian under pass at the mini-secretariat and JNNURM flats. A function was organised by Sheed Bhagat Singh Naujwan Sabha, Italy, and the Azad Hind Welfare Assocation, Amloh, held at Bhadhal Thuha village. The two-day function concluded here today. 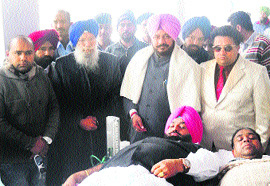 As many as 90 volunteers donated blood to the team of doctors from Gian Sagar Hospital, Rajpura. Over 400 needy students were given woolen pull-overs by the welfare society. Gurjot Singh Dhindsa, a Youth Congress leader from Bassi Pathana, was elected president of the Fatehgarh Sahib Lok Sabha constituency in the elections that concluded on Saturday. Former president of the Youth Congress, Samrala, told about 2,500 persons cast votes and Gurjot was declared president by securing 1,023 votes. Fatehgarh Sahib Lok Sabha constituency comprises of nine assembly areas, including Samrala, Khanna, Payal, Sahnewal, Bassi Pathana, Fatehgarh Sahib, Raikot, Amloh and Amargarh. The Indian International Friendship Society (IIFS) of New Delhi bestowed the Bhart Jyoti Award and certificate of excellence upon Dr Sunil Garg, a research engineer, department of soil and water engineering (SWE), Punjab Agricultural University (PAU), in recognition of his meritorious services and outstanding performance in the field of SWE. Dr Bhishma Narain Singh, former Governor of Tamil Nadu and Assam, presented the award to Dr Garg during a seminar on “Economic growth and national integration”. The Machhiwara police today arrested a person with a haul of intoxicants. According to SHO Amardeep Singh, a police party laid a naka near the Dusehra grounds. When cops signalled the suspect to stop, he tried to escape but was overpowered. During the search of his bag, the police recovered 15,100 tablets of ‘Momotil’, 10 bottles of ‘Rescof’, 35 bottles of ‘Recodex’, 1,100 tablets of ‘Parvon Spas’ and some other tablets. A case has been registered against Manpreet Singh under the NDPS Act. He was presented in a Samrala court, which remanded him in one-day police custody. Athletes from Ludhiana dominated the proceedings on the fifth and final day of the 57th Punjab State School Athletics Championship held at Guru Nanak Stadium here today. 600m race (boys U-14): 1 Amarit Pal Singh of Ludhiana, 2nd Akashdeep Singh of Tarn Taran and 3rd Kuldeep Singh of Patiala. Girls: 1st Harmilan Kaur of Hoshiarpur, 2nd Archana of Sports Wing, Badal (Muktsar) and 3rd Sukhpal Kaur of Sports Wing, Badal (Muktsar). Triple jump (boys U-19): 1st Haramrit Singh of Sports Wing, Jalandhar, 2nd Ranjeet Singh of Tarn Taran and 3rd Sandeep Singh of Ludhiana. Girls: 1st Bhumika Thakur of Ludhiana, 2nd Taranjit Kaur of Patiala and 3rd Harpreet Kaur of Sangrur. Hammer throw (boys U-19): 1st Surinder Pal Singh of Tarn Taran, 2nd Gurmit Singh of Gurdaspur and 3rd Bhupinder Singh of Gurdaspur. Girls: 1st Daljit Kaur of Sangrur, 2nd Manjeet Kaur of Tarn Taran and 3rd Harpreet Kaur of Patiala. Javelin throw (boys U-19): 1st Malkit Singh of Sports Wing, Jalandhar, 2nd Vikas Bishnoi of Sports Wing, Jalandhar and 3rd Navjiwan Singh of Amritsar. 4x400m relay (boys U-19): 1st Ludhiana, 2nd Patiala and 3rd Sports Wing, Jalandhar. Girls: 1st Jalandhar, 2nd Hoshiarpur and 3rd Sangrur. 4x100m relay (boys U-14): 1st Ludhiana, 2nd Patiala and 3rd Sangrur; U-17: 1st Pangarian Wing (Gurdaspur), 2nd Sports Wing, Jalandhar and 3rd Patiala. 4x100m relay (boys U-19): 1st Sports Wing, Jalandhar, 2nd Patiala and 3rd Ludhiana. Girls (U-14): 1st Sangrur, 2nd Hoshiarpur and 3rd Ludhiana; U-17: 1st Bathinda, 2nd Kairon Wing and 3rd Gurdaspur; U-19: 1st Sangrur, 2nd Jalandhar and 3rd Kaioron Wing, Tarn Taran. A scintillating batting display by Arjun Puri who remained unconquered on 67 runs steered Deepak Builders XI, Ludhiana, to record a facile 79-run victory over Chak De Cricket Club from United Kingdom to romp home in the Chak De Cricket Cup Tournament that concluded at Punjab Agricultural University ground here today. A total of six teams participated in the tournament. Both teams won four matches each to settle for the final. In the final, Deepak Builders XI batting first made 139 runs for the loss of three wickets in the stipulated 12 overs. Their innings revolved around Arjun Puri who faced 28 balls and remained unbeaten on 67, which included three towering sixes and four hits over the ropes. Chinton Sehgal contributed 20 runs, while Riku and Gurjit Walia chipped in with 18 runs each. Defending the total, Deepak Builders XI restricted the visitors to 60 runs in 11.4 overs. Only, two batsmen, Veeru and Ashish, could reach double figure, making 20 runs each. For the winners, Sunny Kumar was the pick of the bowlers who scalped four wickets for eight runs in four overs. Sakun Verma and Jagarpreet Singh grabbed two wickets each after conceding 10 runs, while Piyush Likhi captured two wickets for eight runs. Arjun Puri who made three half centuries in the tournament was named the best batsman, while Veeru of Chak De Cricket Club who took 14 wickets and scored 85 runs was adjudged the best all-rounder. Deepak Builders XI took home cash prize of Rs 25,000, besides winners’ trophy and losers pocketed cash prize of Rs 11,000 in addition to the runner-up trophy. The word “consistency” appears to be synonymous with the local shuttler, Pranav Chopra, who continues to excel at the international-level badminton tournaments and adding titles after title in his kitty. This shuttler, a trainee of the Ludhiana Badminton Academy, hogged limelight as he won the doubles title in the Tata Open India International Challenge-2011 held between December 15 and 19 at Mumbai. The duo of Pranav and Akshay Dewalkar emerged champions in the tournament, in which US$15,000 were at stake to grab. In the final, the pair, who started as underdogs did a commendable job and tamed their experienced and ranked duo of Sanave Thomas and Rupesh Kumar. Thomas and Rupesh are 26th World Ranking players. Nearly 164 players from 14 countries competed in the tournament, which was organised by former all-England champion Prakash Padukone. Pranav and Akshay started on a dismal note, losing the first set with a whisker (19-21). However, in the next set, they bounced back with a vengeance, wrapping it up 21-17. The third set turned out to be a see-saw battle with both pairs fighting for each point and eventually, Pranav and Akshay managed to scramble past 23-21 that also fetched them the match as well as the coveted title. They also got gold medals, besides US$1200 as the prize money. Earlier, in quarterfinals, Pranav and Akshay defeated Ross Smith and Glenn Warfe (second seeded) of Australia 21-18, 22-20 to advance into the semifinals. In the semifinals, Pranav and Akshay exhibited superb play to put to mat the fourth seeded Indonesian pair of Christopher Rusdianto and Andrei Adistia whom they overpowered 18-21, 21-15 and 21-18. Malkit Singh, a javelin thrower, clinched a gold medal in the state-level Punjab School Games. Malkit participated in the under-19 javelin throw event with the determination to break the last record. But unluckily he was not able to achieve his target. The last record was 65 metres and his javelin throw only covered a distance of 62 meters. Malkit was glad that he is going home with a gold medal. “I am happy with my performance. I did not fulfill my desire in these games but it is enough for me because it is my biggest achievement after my shoulder injury,” said Malkit. Malkit is now preparing for the Junior Federation Cup, which is going to be held at Chennai in May 2012. "In India, there are about 7.17 lakh honey-bee colonies. These colonies of Italian honey bee are producing 2,65,500-quintal honey with an average of over 37.06kg/colony/year. This was stated by scientists of Punjab Agricultural University (PAU) of Krishi Vigyan Kendra (KVK), Muktsar. They said Punjab was having the largest number of 2,50,000 colonies. There are 25,000 bee-keepers in the state and honey production is 10,000 metric tonnes. Although Punjab is a leading state in India in honey production, yet there is a lot of scope for expanding this enterprise as there is sufficient area under agricultural crops and wild fora which can support 1.2 million colonies. The experts said proper marketing was an important aspect for growth and prosperity of bee-keepers in Punjab. Dr NS Dhaliwal said distribution played an important role in marketing. It was essential to set the profits for stockist, distributors, dealers and sub-dealers. “The honey sold in recycled bottles does not receive the deserved appreciation,” he added. Harmilan Kaur secured first position in the 600 metres race in the under-14 category of the state-level Punjab School Games. Although, it is not the first achievement for Harmilan Kaur, she was glad to wear another gold medal around her neck. A student of class VIII and just entered her teenage, Harmilan practices one hour in the morning and two hours in the evening everyday to make it big in the sports. Interestingly, Harmilan’s mother Maduri A Singh is an Arjuna awardee and a silver medallist in the Asian Games and her father Amandeep Singh is also an international athlete. “It is her beginning and we are observing her dedication towards the sports. We hope one day she will definitely participate in the Olympics and win laurels,” said Maduri. A city resident saved the life of a calf that was stuck in a quagmire located on the Hambra-Ladhowal road. Inder Bhan, alias Kakka, a resident of Haibowal, said he saw the male calf stuck neck deep in a quagmire here this morning. “I along with other area residents arranged for the rope. Fortunately, the rope stuck around its neck and the calf was safely rescued,” said Kakka. It is leant that the calf was stuck in the quagmire since night, but no one offered help.